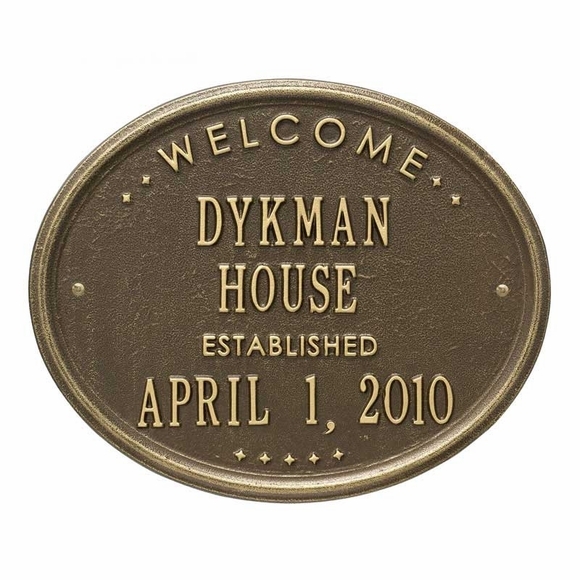 Oval Welcome Plaque - - personalized Welcome Oval House Established sign that displays the name of your house and the established date. Wall mount. Made in USA. Perfect for a business with "House" in its name or a special residence (historic or newly built). Line 1 is for the house name and holds fourteen (14) 1.25" characters. Line 2 is for the established date and holds thirteen (13) 1.25" characters in the format shown in the samples. Character count includes spaces and any punctuation. The words "WELCOME" at the top, "HOUSE" in the middle, and "ESTABLISHED" just about the date are all standard. Color combinations: BG black plaque with gold characters; AB antique brass; OG bronze plaque with gold characters; AC (antique copper); WG white plaque with gold characters. Dimensions: 14" x 11.43 x 0.375". Porch mount or Wall mount. Includes mounting hardware. Oval Welcome sign personalized with the name of your house and the date it was established. Wall mount. Made in USA. Very happy with my purchase! Product was as described and delivered in the time specified.